My clients often tell me that they ‘live’ outdoors in the summer. But with Australia’s population set to rise, and with the desire for larger houses on more compact blocks, we will -whether we like it or not – be left with smaller and smaller outdoor spaces in which to enjoy our great way of life. Unfortunately the outdoor area is often the home’s smallest room and in many cases it is confined to the modest rectangles of unused space left after the house is finished. Historically, landscaping has been an integral part of architecture. Considering the whole of the site as the canvas for indoor-outdoor living means it can be designed so that we get the most effective use of every square centimetre of space. Without question this whole-of-site approach gives the best opportunity to consider indoor-outdoor connections, to provide a beautiful view from inside and to allow enough space for each area to be functional. My philosophy as a landscape designer is that house should look as if ‘it’ has been planted in the garden. A really well designed house can preclude completely the requirement for the ubiquitous attached covered alfresco area. After all when space is tight, it makes sense to consider the advantages of a well-designed living-dining area that opens completely to the garden. With the kitchen only a few steps away, the outdoor space doesn’t have to be filled with yet another dining room and a replicated kitchen. The freed up space can then be given over to more appealing elements such as plants, water and perhaps a view to the sky – all visible from inside – and when the weather is inclement and the glass connecting doors are closed the garden is only a step away. What if I already have a covered alfresco area? 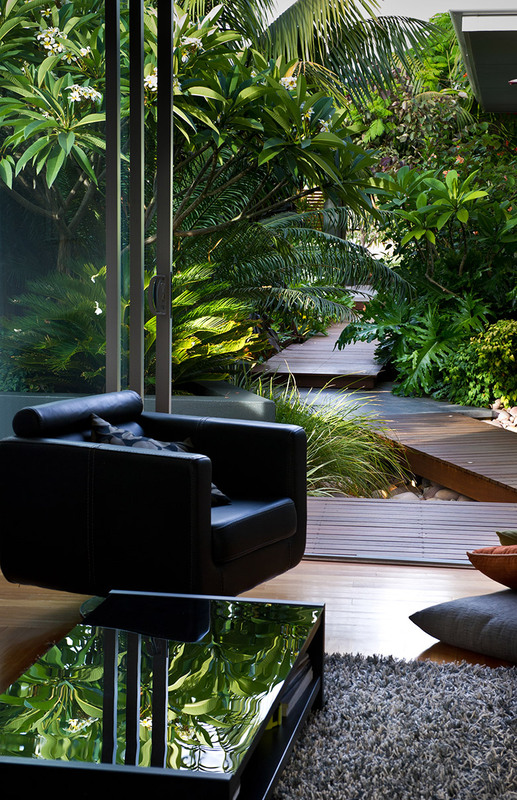 Well most people in Australia do already have a covered alfresco of some sort, but it is still possible to create a beautiful garden beyond, no matter how small the space. Don’t be tempted to fill your alfresco area with bulky furniture. Select furniture that sits lightly on the ground so you can see the floor under it. It will make the area appear larger. Think about where you place your bbq – it should not be the focal point and should not be visible from inside if possible. Try not to make your limited outdoor space all things to all people. If its small, decide whether you want to lounge or dine in the space. Taking up too much room outside with ‘stuff’ limits the amount of garden you will have, and after all, we need to remember why we want to sit outside in the first place. Small gardens in particular, require a good underlying design. 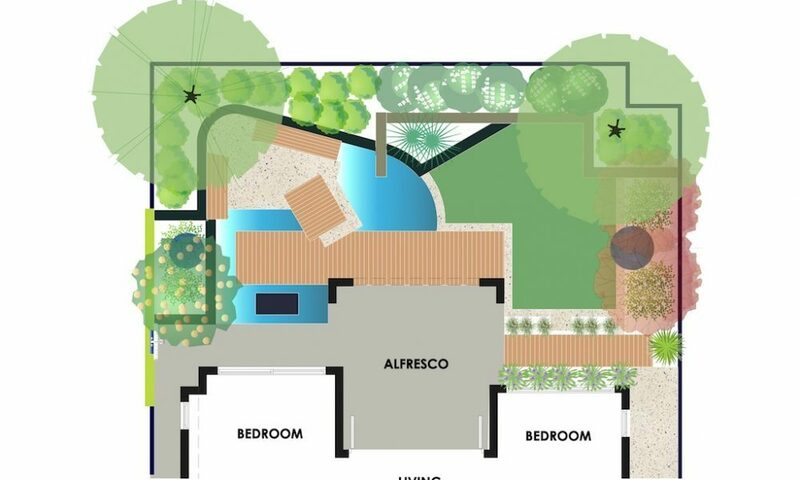 Small gardens are actually harder to design than larger ones because you will need all the same elements incorporated but in a much smaller area. 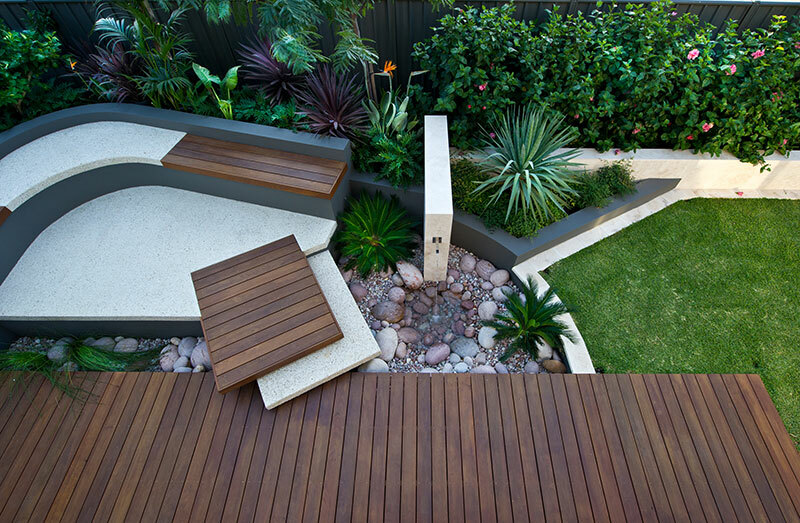 If you are not comfortable doing this yourself, it is worthwhile investing in a landscape design. If you are a creative amateur and want to have a go at it yourself there are a few strategies that you can consider before you get started. Consider how your doors open. If you have little outdoor space, then open your bifold doors inwards or consider sliders. Consider your floor levels. If possible drop your doors into the floor so you can have a seamless connection with the indoors. Don’t fill your garden with indoor trappings such as bulky furniture and full on outdoor kitchens. Draw yourself a scale plan using some graph paper so you can get an idea of layout and how best to select and place your furniture.